Fisher Hill has a new ebook available on its webpage. It’s English Reading and Spelling for the Spanish Speaker Book 1. The workbook is also available in hardcopy but now you can download it and have it the same day. No hassle with shipping and waiting for the book to arrive. 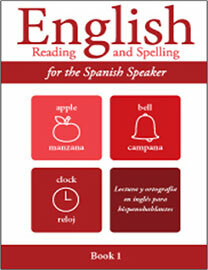 This workbook was written to help Spanish-speaking students to read and spell. The workbook uses Orton-Gillingham principles to teach reading and spelling. The Orton-Gillingham approach uses structured, explicit, systematic and multisensory procedures in teaching the forty-four speech sounds. Reading and Spelling Book 1covers the five short vowel sounds, two long vowel sounds and beginning blends. There are twenty lessons in Book 1. Each lesson has five to six pages. Each lesson beginswith a word list that includes words with the targeted sound for that lesson. Many of these words can also be used as vocabulary words. The next pagein the lesson works with developing comprehension skills. The third pagein the lesson is a fill in the blank page so students can practice using the words from the word list from the first page of the lesson and the high frequency words from the second page of the lesson. There are pictures from the first page of the lesson at the end of some of the fill in the blank sentences since many sentences could have more than one answer. Students use the pictures at the end of the sentence to know which word from the word list to use. The fourth pageof the lesson practices spelling, grammar, vocabulary or a writing activity. The last pageof the lesson ends with a Word Search of the targeted and high frequency words from the lesson. Students including adults like our workbooks because the pace is reasonable, print is large, directions are in Spanish, and the content is for adults. Teachers like our books because everything is ready to go! If you have any questions about our workbooks, please email us at therst.com. Go online at www.Fisher-Hill to see all of our products.